The House History Man: Mystery: Miss Manners Childhood Home in AU Park? Mystery: Miss Manners Childhood Home in AU Park? I love it when a homeowner in Washington, DC contacts us to investigate if a rumor they heard from an old neighbor is really true. Especially if that involves a famous person, as did the owners of 4826 Davenport Street, who conveyed with much trepidation that they had heard their house was the childhood home of the beloved columnist Miss Manners – aka Judith Martin - could it be true? “Anything is possible,” I replied, and we went to work. The first thing I investigated was to find out what her real name was, and approximately how old she was. Then we went to work on the house itself, when it was built, and creating a successive line of owners or renters. The thought of composing a letter to Miss Manners left me many sleepless nights: how on Earth does one get it just right? Typed or hand written? The house at 4826 Davenport Street was by William B. Pichler and William Richmond of the Pichler-Richmond Construction Company, who received a building permit on October 2, 1936. They listed themselves as the builders, and William Crusemire as responsible for its design. It was to be constructed for an estimated cost of $6,000. 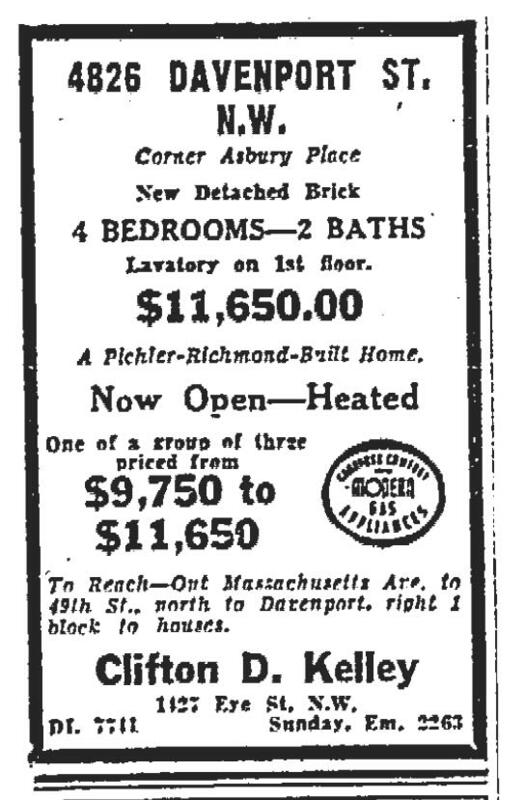 An advertisement for the house appeared in the Washington Post on January 10, 1937, when it was listed for $11,650.00 by real estate agent Clifton D. Kelley. 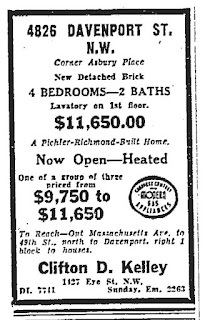 Pichler & Richmond sold the newly completed house on February 10, 1937 to Jacob and Helen A. Perlman. They obtained a mortgage in the amount of $9,000, and a second mortgage in the amount of $7,000 that was due in three years. The Perlman’s would own the house for the next eighteen years, until 1955. There was the answer: Miss Manners was born Judith Sylvia Perlman! But, we had to make sure we had the correct Perlman family, as there were dozens in Washington at the time. Either way, the Perlman family that purchased 4836 Davenport Street was turning out to be quite interesting. Jacob Perlman was born on May 10, 1898 in Byalostock, Poland. 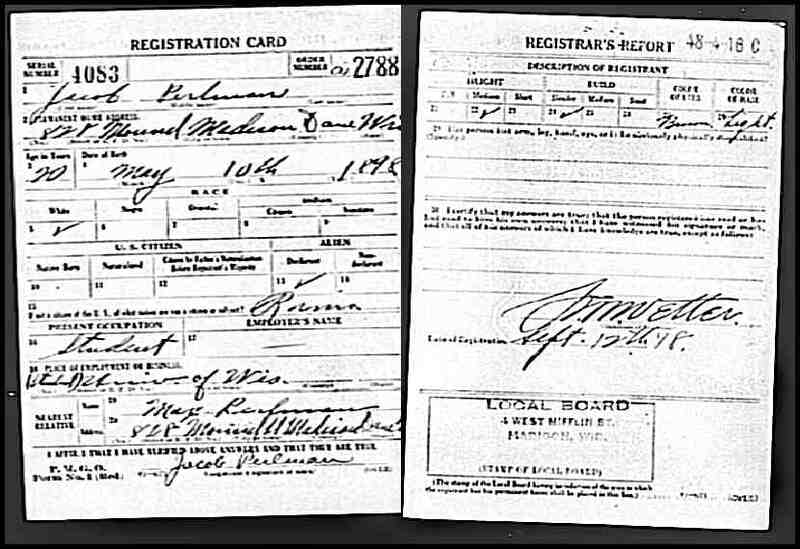 He immigrated to the United States in 1912 with his father, Mordecai (aka Max) and mother Pauline to Madison, Wisconsin and became a naturalized citizen in 1918. They had been invited by their brother Selig, who had already begun a lifelong academic career at the University of Wisconsin. 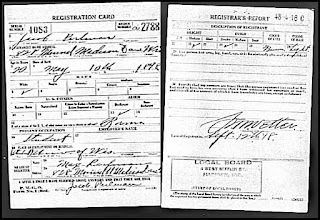 Jacob’s WWI Draft card (below), filled out on September 12, 1918 indicated that he was of medium height, slender build, with brown hair and light colored eyes. He graduated from the University of Wisconsin in 1919, and spent the next two years as statistician of the New York State Department of Labor. He was listed as a lodger at 1156 Brookline Avenue in Albany, NY in the 1920 census, and indicated that his native language was Yiddish. In 1921, Perlman returned to the University of Wisconsin for graduate studies and to teach in the Economics Department. He obtained his M.A. in 1922 and his Ph.D. in 1925. Perlman moved to Washington, DC in 1933 as a staff member of the Committee on Government Statistics, and married Helen Aronson in 1935. The Perlmans had a son named Matthew Saul and a daughter Judith Sylvia Perlman who was born on September 13, 1938. Matthew attended Brown University and Harvard Law School, and eventually became a partner at Arent, Fox. With that in mind, I penned a letter to Miss Manners once I found her mailing address – handwritten on heavy cardstock stationery – and asked about her youth at 4836 Davenport Street. She responded via a phone call – and was it fun to talk to her about the house! In 1943, the Perlman’s took out a classified advertisement in the Washington Post to seek the return of a lost sugar ration booklet that had been issued to their daughter Judith, not unusual despite the fact that she was only age 4 at the time. A 1948 Washington Post article included Judith among local youth that had collected unused streetcar tokens for donation to Children’s Hospital. Judith’s mother Helen had been born in New York City in 1902, and attended the Maxwell Teacher’s College. She began her teaching career in the public schools of New York City, and in the 1940s after moving into 4826 Davenport Street, she became a member of the Visiting Instruction Corps and taught disabled children in their homes. Between 1951 and 1956, Jacob Perlman served as a United Nations advisor on economics to the governments of Colombia, Greece, Bolivia, and the Philippines, before joining the National Science Foundation, where he eventually became the head of the office of Economic and Manpower Studies. 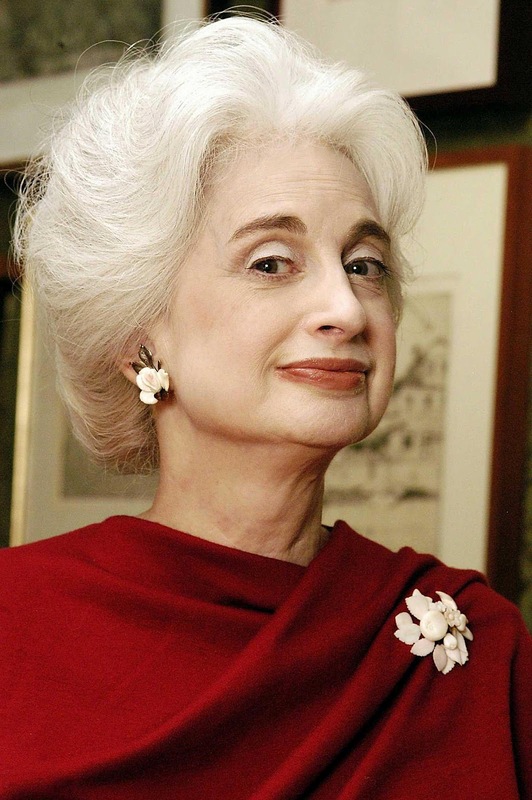 It was living in various foreign countries that daughter Judith credits with establishing her knowledge and passion of both manners and etiquette. Judith began attending Wellesley College before the family returned from abroad, graduating in 1959. She married Robert Gene Martin, a graduate of Harvard College as well as Harvard Medical School. The remaining four days Martin devotes to other writing: book reviews, speeches, a new novel titled Style and Substance. Her first, Gilbert, a rather arch attempt at a comedy of manners, received generally favorable reviews in 1982. She has also published a collection of newspaper essays, The Name on the White House Floor (1972). Judith Martin continues to reside in Washington, DC, and was the recipient of a 2005 National Humanities Medal from President George W. Bush. On March 23, 2006, she was a special guest correspondent on The Colbert Report, giving her analysis of the manners with which the White House Press Corps spoke to the President. Her advice column is distributed three times a week by United Features Syndicate and carried in more than 200 newspapers worldwide. She also produces a column for the Microsoft Network. 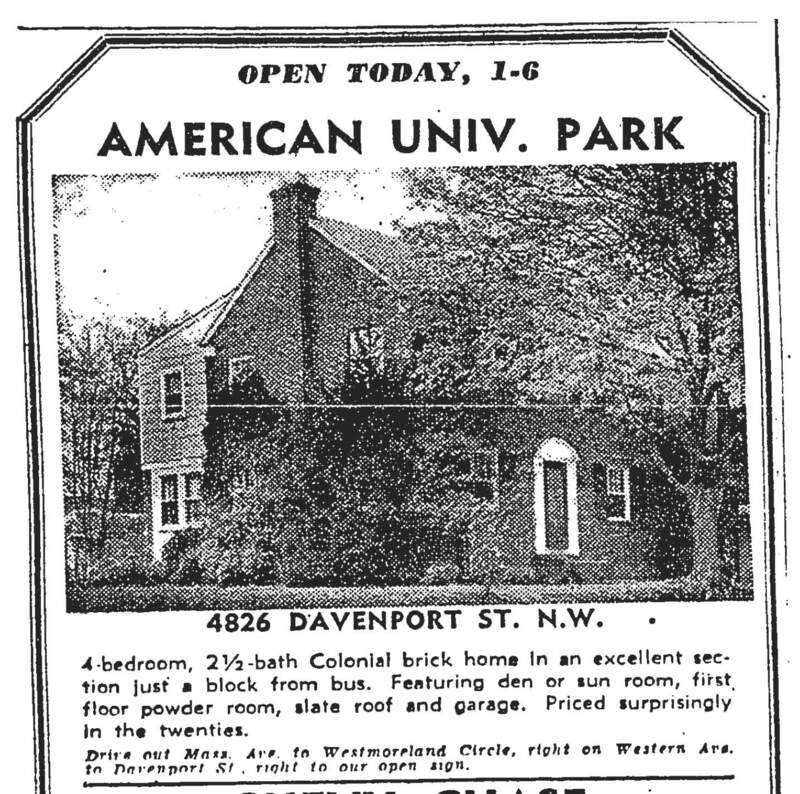 4826 Davenport Street was advertised for sale in the May 1, 1955 edition of the Washington Post (left), “Priced surprisingly in the twenties.” Later in life, Perlman taught at American and Catholic Universities, Johns Hopkins University and the University of Connecticut. He joined the esteemed Cosmos Club in 1963. Jacob Perlman died in April of 1968 in Israel while on a celebratory vacation to Greece and Israel with his wife Helen. He is buried in King David Memorial Park in Falls Church, Virginia. At the time, he and his wife Helen resided in an apartment at 2900 Connecticut Avenue, NW. The Perlmans sold 4826 Davenport Street on September 19, 1955 to William John and Anne L. Middleton. 1920 census record for Albany, NY, Ward 3, Enumeration District 66. “I Have Ten Forks,” Time magazine, November 5, 1984. Washington Post, October 20, 1948. 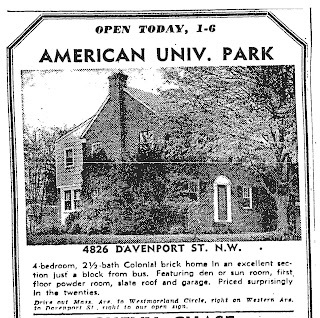 Note that the front entrance in 1955 did not have a small porch constructed over the doorway. 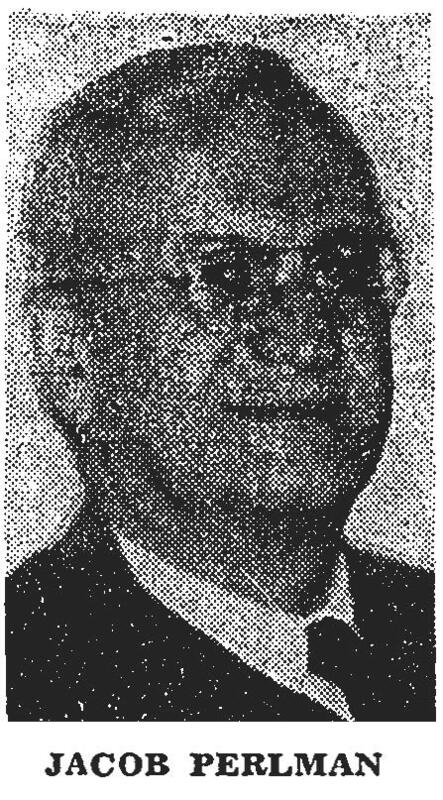 “Jacob Perlman Dead; Economist, Educator,” Washington Post, April 10, 1968, pg. B3. In 1968, daughter Judith and her husband resided at 1651 Harvard Street, NW, while son Matthew lived at 5280 Wisconsin Avenue, NW. Interested in your own house history? Your Old House Had Dead Bodies In It - Almost Guaranteed. The Tea Party's View of Washington in 1889? The Ruined Capitol-an architectural eulogy of what was Washington, D.C.
14th & L Street N.W. For those addicted to Houses! Copyright Paul K. Williams. Simple theme. Theme images by duncan1890. Powered by Blogger.